With the Sun opposing Neptune today, you may feel like you’re in a state of limbo. You could be frustrated over something that’s taken too long to materialize or a sense that nothing is really happening for you despite your best efforts. The Hanged man refers to a time when the Universe puts road blocks in your path — often for your own good. You may have been running at a break-neck pace, never stopping to look at what you’ve accomplished. Or you may have found yourself losing steam over a project that just hasn’t panned out. Either way, it may be time to put things on hold — at least long enough to evaluate your commitment. This is also true of relationships. 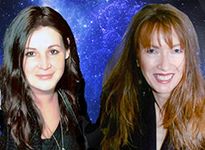 Whether you’re in an established relationship (or just exploring an interest in one), it could also be time to take a step back from that as well. The Hanged Man card is also about surrender. Letting go and letting God. Holding back from trying to change the natural course of things because your own input could (and would) interfere with their development. 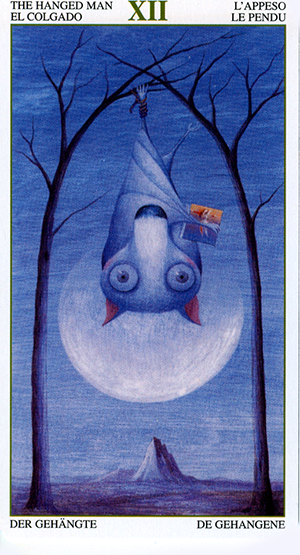 The Hanged Man appears in this card as a bat suspended between two scrawny trees, with the waxing moon looming behind him. He’s wrapped up in his own wings like a cocoon. He holds on tightly to his one possession: a tiny book. Perhaps he’s using this time to gain insight and wisdom. He may be in limbo but he’s not sleeping. His eyes are wide open. He’s acutely aware of his surroundings, and if you look closely you’ll see that only one foot is bound. the other he stretches toward the second tree and uses it for balance. He’s not only surrendered to this process but has become an active (or inactive in this case) participant. The card used for today’s tarotscope — the Hanged Man — is part of the Tarot of the Magical Forest series. This deck was created by Hsu Chi Chun (author) and Leo Tang (artist). The LWB was written by Giovanni Pelosini. The Tarot of the Magical Forest is a Lo Scarabeo deck published by Llewellyn.